Sony KDL-46HX853 review | What Hi-Fi? When we tested the larger version of this set, the Sony KDL-55HX853, we speculated that Sony had rediscovered its TV mojo after a year or two in, relatively speaking, the doldrums. After sampling the cheaper Sony KDL-46HX753 and this Sony KDL-46HX853, that’s an impression that’s only getting stronger. Sony’s a past master where the issue of simple pride of ownership is concerned, and the KDL-46HX853 is a potent combination of svelte good looks, robust build quality and exemplary finish. The sheet of tough Gorilla glass gives a seamless appearance, the full-width plinth that serves as both stand and speaker array is both a functional and aesthetic plus-point, and the ‘relaxed’ stance (the screen leans back a little on its plinth) is a nice flourish too. Ergonomics are as per the KDL-46HX753, and consequently the KDL-46HX853 is an absolute doddle to set up. It’s simple to get a workable picture from, but has sufficient finessing options to keep inveterate fiddlers amused for hours. The control interface is an entirely unremarkable remote wand (there’s none of your LG-style motion or voice shenanigans here), but it’s logical and legible – and the buttons are all of a decent size. And there’s a remote control app for iOS and Android that’s altogether more attractive. Picture performance, broadly speaking, is as gratifying as the looks. 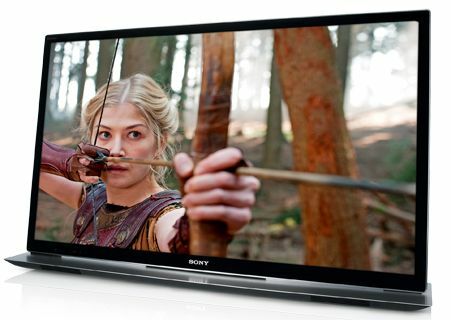 The Sony’s quite staunchly intolerant of standard-definition TV broadcasts – picture noise, coarse edge definition and miserly detail levels are the norm rather than the exception – but up the ante with a bit of BBC HD via the Freeview HD tuner and the HX853 smartens up its act more than somewhat. The Sony’s excellent, uniform backlighting allows for lustrous, detailed black tones to share screen space with clean, fairly bright white shades – contrast perhaps lacks some of the out-and-out dynamism of the contrasts of the more expensive Panasonic TX-L47WT50, but bows to no rival where detail and cleanliness is concerned. Colours are wide-ranging and believable, with skin-tones a particular highlight, and the Sony handles even the most vigorous movement without alarms. Textures are described well too – they’re perhaps short of the outright subtlety of the Panasonic TX-L47WT50, but they’re clean, sharp and punchy nonetheless. There’s similar fidelity to the BBC’s iPlayer when accessed via the HX853’s exemplary Sony Entertainment Network. The SEN’s menus are bold and attractive, and given half-a-chance with a decent quality stream the Sony shows the same low-light prowess and authoritative motion control as it does with the best TV broadcasts. Where 2D Blu-ray images are concerned, the HX853 really shines. Inky, detail-laden blacks, smooth edge definition and martial control over both complex patterns and motion add up to a believable, endlessly watchable picture. And if the Sony’s contrasts lack just a touch of outright white-tone punch, well, the amount of detail on offer goes a long way towards making up for it. Sony’s reluctance to bundle any active-shutter 3D glasses with the KDL-46HX853 is a bit tight, and the current ‘buy-one-get-one-free’ offer on spectacles isn’t all that much compensation. Still, if you shell out for the glasses you’re rewarded with as stable and unstressy an active-shutter 3D experience as we’ve seen. TT3D: Closer To The Edge enjoys tremendous depth of field, motion is dealt with confidently and pictures remain plenty bright and colourful enough. In fact, the biggest drawback to watching 3D movies (or playing 3D games, for that matter) is how relatively heavy and cumbersome Sony’s 3D glasses are when compared to the likes of Panasonic’s or Samsung’s. After all of this good news, the HX853’s upscaling of DVD pictures turns out to be a bit of a disappointment, though hardly a mortal shortcoming. DVD images are a bit noisy, a bit edgy and give away a lot of dark-scene detail: you’re better off letting your Blu-ray player take care of upscaling duties. For last, we’ve saved if not the best, then definitely the most unexpected. As we said at the top of the review, the HX853’s plinth incorporates speakers – and so unlike the overwhelming majority of flatscreen TVs it offers a spacious, focused and, above all, hefty sound which is miles removed from the flatscreen norm. Of course, there are speakers in the chassis of the screen if you wish to wall-mount it, but they’re no better than average. As an overall package, there’s just no disputing the Sony KDL-46HX853’s case. Its contrasts could conceivably be stronger, and those who need it to upscale a lot of DVD movies might think twice, but in every other respect the Sony’s hugely impressive. It’s early days, sure, but this is going to take some shifting come Awards time.